Pakistan has said Prime Minister Narendra Modi crossed the "red line" by talking about Balochistan and asserted that it will "forcefully" raise the Kashmir issue at the UN General Assembly session next month. 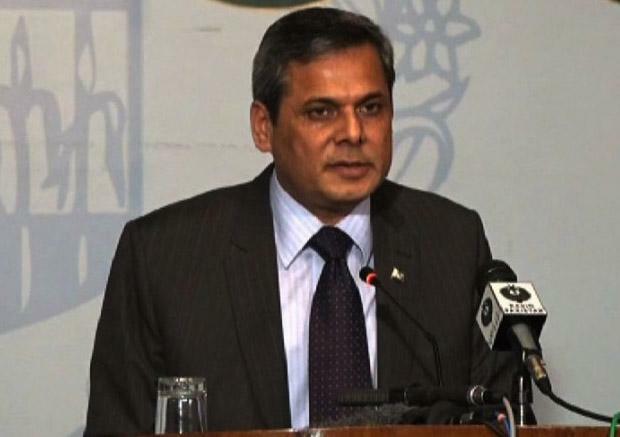 "The Prime Minister strongly pleaded the case of Kashmir during General Assembly session last year and we will again forcefully raise the issue," Foreign Office Spokesperson Nafees Zakaria said. Zakaria, in his weekly news briefing in Islamabdad, also took strong exception to the remarks by Prime Minister Modi on Balochistan. Prime Minister Modi had brought up Pakistani atrocities on people of Balochistan and PoK in his Independence Day speech. "It is the violation of the UN Charter...He (Modi) crossed the red line by talking about Balochistan," Zakaria said. He alleged that India was involved in subversive activities in Balochistan and Karachi. Zakaria also claimed that India was referring to Balochistan to cover up its human rights violations in Kashmir. Zakaria said Prime Minister Sharif will lead the official delegation at the General Assembly session. He said the UN Secretary General and most of the UN members had already been informed about the "precarious situation" in Kashmir. Zakaria said the UN and international community should remind India that it must fulfil its commitment to give the right of self-determination to the people of Jammu and Kashmir as per Security Council resolutions. He said the issue was still outstanding on the Security Council agenda for more than six decades.